The media often exposes, almost with glee, Christians who have fallen from grace. It seems that Christians are supposed to discard humanness and acquire immunity to worldliness. 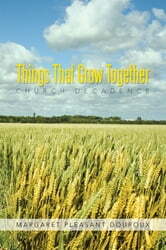 In godly wisdom, the book of Matthew, chapter 13 explains that there will always be tare that grows among the wheat. The church is often thought to be a congregation of perfect, unspotted people. But the truth of the matter is that congregations often consist of those who lie and commit adultery, alcoholics, and many who are guilty of worldly sins. Congregations are unperfected sinners who are saved by grace. Perfection comes a long way down the Christian path, and only through the grace of God. I am a common everyday Christian who has fallen short enough to know that only when this life is over, and only when we are in the presence of a perfect God, will we be able to claim the ability to walk totally sinless. Until the day we stand in the presence of a perfect God, we will stand imperfect. In that day, we will be like him.